Echinacea belongs to the composite family – Compositae – which is the pistillate plural form of the Latin word compositus and means: composite-flowered. Echinacea is closely related to the genus Rudbeckia named by the famous botanist and medical doctor, Linnaeus(1707-1778) after his teacher Mr. Olaf. Rudbeck(1660-1740) who was a professor in the botany and anatomy in Upsala(Sweden) and a publicist of several botanical books. 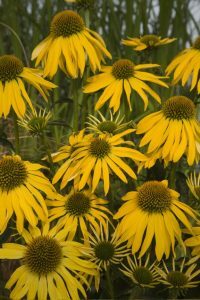 The difference between Echinacea and Rudbeckia hardly can be understand by a layman. The, to the eye, scarcely perceptible and visible difference between the two genera only can be observed by comparing the flower heads and because the colours of the ray floret deviate. Echinacea derives from theGreece word echinos which means: hedgehog and refersto the thorny chaffs in the centre of the capitulum. Echinacea and Rudbeckia are indigenous in North-America. Are there from Rudbeckia about 25 species known, today European botanist say thatonly 5 species belong to Echinacea…angustifolia ;atrorubens; pallida; paradoxa and purpurea, however, according to Dennis Carey / Tony Avent of Plant Delights Nurseries Inc(USA) in 1968 taxonomists distinguished 9 Echinacea species and 4 sub-species under which also….tennesseensis; laevigata; simulata and sanguinea are mentioned. Dennis Carey says: ‘where their habits overlap, the species readily interbreed, so there are many populations of naturally occurring interspecies crosses that have intermediate traits’. Echinacea angustifolia. Common name: Narrow Coneflower. Synonym: Echinacea sanguinea. Angustifolia comes from the Latin words angustus which means: narrow and folium which means: leave, so narrow-leaved / lanceolate. Sanguinea derives from the Latin word sanguis or sanguïnis which means: blood or blood red. Echinacea atrorubens is indigenous in Arkansas and Missouri(USA) atro comes from the Latin word ater or atri which means dim black and rubens which means black red. The colour of Echinacea atrorubens is purple red; the flower head has 12-20 ray florets of 2-4cm long. The sturdy stems can reach a length of 50-80cm. The leaves are long lancet-shaped to elliptical. Echinacea pallida. Common name: Pale Coneflower. pallida derives from Latin pallëre and means: pale. It refers to the pale pink colour of the long and hanging petals with whitish pollen. The upright stems are hairy; the leaves dark green wide lanceolate acuminate. Echinacea purpurea. This is the most important one of all the species and used by former and today breeders for developing new varieties in combination with Echinacea pallida and Echinacea paradoxa. Purpurea comes from Latin and simply means: purple-coloured. About the colour ‘purple’, there are different opinions among systematists and are not specified more precisely. All the colour shades, from pale-pink to darkblue-red are designated with the name purpurea. Echinacea purpurea is originated from the open woodlands and prairies in the USA. Already in the 17th century this Echinacea was planted in European Public and private gardens and is still popular. Today, it mainly are the Echinacea purpurea hybrids and selections which are in cultivation. If you ask somebody after Echinacea purpurea serotina or Echinacea purpurea intermedia and Echinacea purpurea specisosa nobody knows. They refer to the Rudbeckia group. Echinacea purpurea Fatal Attraction was bred by the famous garden architect and garden designer, Piet Oudolf(see my article about Persicaria). The combination of the wine-black stems holding the intense purple-pink flowers attracts many garden visitors. Piet Oudolf also bred the first green one, named Green Jewel. It has light green flowers with a green cone. The flowers hold their colour as they age. To mention all the today breeders of Echinacea and to describe all their varieties is impossible as this requires a complete booklet. 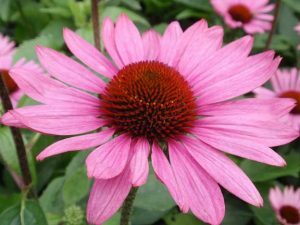 An explosion of new Echinacea cultivars have been introduced the last 5 years and many new introductions may be expected to be introduced in the years to come. Within the scope of this article I have no choice but to confine myself to the main European(Dutch) breeders of Echinacea. As the basis of all the new Echinacea introductions was laid in the USA, I however, wish to honour some of them for their ‘break-through’ breeding work in Echinacea. In all fairness, I have to admit that the very first breeder who started interspecies crossesby crossing Echinacea paradoxa and Echinacea tennesseensis, was Dr. Jim Ault of the ChicagoBotanic garden, resulting in orange and pastel colours. All the breeders who are successful in breeding Echinacea today, took advantage of the trail-blazing(pioneering) work of dr. Jim Ault. One of them is Richard Saul of ITSaul nursery, who also started interspecies crosses. 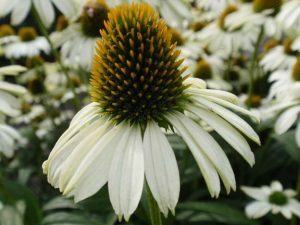 Richard, however used Echinacea purpurea as one of the parents, resulting in better and longer-lived Echinacea hybrids. The Saul brothers –Richard and Bobby- introduced the ‘BIG SKY’ series of Echinacea. 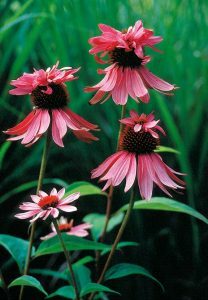 John Walters(Walters GardensUSA) says: all the members of this series exhibit the more favourable characteristics of Echinacea purpurea, a more compact well-branched habit with broader leaves and large flowers with wider petals. Top varieties are: Harvest Moon; Summer Sky; Sundown and Sunrise. Also Terra Nova Nurseries in Oregon(USA) must be credited for bringing new Echinacea hybrids, having intense colours, to the market. 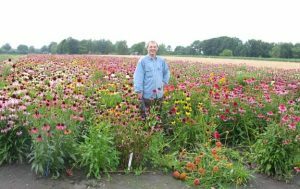 Other well-known American Echinacea breeders are Mark Veeder, breeder of Echinacea GREEN ENVY. When mark Veeder showed a photo of his variety to Tony Avent, Tony’s first thought was: for sure, this variety was created by Photoshop. After growing and photographing the plant himself, Tony says: this variety is truly unique. 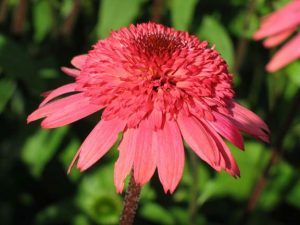 Kim Hawks is the breeder of Echinacea Kim’s Knee High, having large, daisy-like flowers with clear pink, re-curved ray petals and large, bronzy-orange central cones on knee-high plants. Last but not least must be honoured Kevin Hurd of WaltersGardens, who bred the very first real Echinacea spider type, named ALL THAT JAZZ. It is described as follows: incredibly unique new hybrid with completely quilled ray petals. Fragrant, lavender pink flowers with an orange cone are produced on strong, tall stems. Marco van Noort and his wife Heidy run their nursery in an idyllically situated place near the romantic village Warmond in the very west part of Holland, close to the North Sea.Marco, already is the third generation in the Van Noort family, running a nursery, so, like we say in Holland: he learned growing plants at his mother’s knee; he was brought up on that. The interaction between Marco and his wife Heidy in their passionate love for growing plants is clearly visible in their nursery. It has a certain magic and shows that Marco and Heidy are persons, possessing charisma and self-confidence. Marco’s interest in breeding perennials began after visiting the famous nursery of the late German breeder, Ernst Pagels, well-known for his breeding work in Miscanthus. Ernst Pagels had his own vision on breeding and used a certain technique, resulting in beautiful and strong cultivars. Marco uses ‘true-to-nature’ sources such as honey-bees which are indispensable in his way of breeding, resulting in healthy; sturdy; strong and visually attractive plants. In this way, Marco successfully bred new varieties of Bergenia; Epimedium; Geranium; Rodgersia and Echinacea. The criteria for bringing a new variety to the market are subject to hard and fast rules. Fragrance; hardiness and re-blooming characteristics play an important role in taking the final decision for marketing his ‘creations’. From thousands of seedlings, mostly no more than 3 do meet the criteria of Marco. Breeding plants is a kind of hobby and financially mostly not attractive. This work never finishes but gives a lot of pleasure and satisfaction, discovering new colours and shapes. Echinacea Irressistible, a fully double orange double coneflower of 85cm height. It flowers from June till September. Echinacea Meditation is a 30cm high pot variety. The colour is hot pink. Last, but not the least is Echinacea Summer Breeze, a canary yellow Echinacea. The strong and healthy plant flowers from June till September. Mr. Double is the nickname ofMr. Arie Blom, the well-known breeder of double flowering Echinacea varieties. When finishing college, Arie started studying Plant Breeding at the AgriculturalUniversity. He studied different kinds of techniques, used in plant breeding. Also tissue culture, growing plants in artificial circumstances in a laboratory, added a new dimension. His major in plant breeding for example, was about microspore culture, a laboratory technique with plants which can be grown out of pollen. 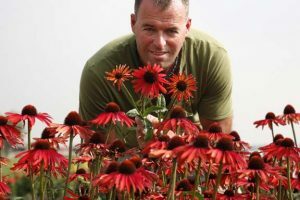 After his graduation Arie got a job in a vegetable breeding company but changed to ornamentals after 12 years and in the meantime he started breeding with herbaceous perennials as a hobby in his back yard and this hobby was the very beginning of his success in breeding Echinacea. Due to lack of space and having no land of himself, he made a joint venture with another grower and began marketing his new varieties. It takes too much place to describe all his introductions. Just have a look at the pictures to conclude how valuable the varieties of Arie are. The very first Echinacea Arie introduced was Echinacea PINK DOUBLE DELIGHT, followed by the white double Coconut Lime, the elegant Champagne Bubbles and the compact growing Meringue and the pure white Milkshake. In the meantime, Arie started to cross those varieties with other species in order to get more colours in double flowering Echinacea. The bright red Echinacea Hot Papaya was his first interspecific hybrid he introduced in 2008 followed by the orange double Marmelade; the yellow double Pineapple Sundae and his most favourite one, Echinacea Raspberry Truffle, a very floriferous one with soft red flowers on distinctly dark stems. Last year, Arie also introduced a two-tone Echinacea, called Strawberry Shortcake, having creamy-white rays at the bottom and dark pink flowers on the cone. Since Arie started to use a few wild species in his breeding program, combined with modern breeding techniques he says: ‘an enormous variation has been obtained in my program out of which I select the best ones. Arie Blom, undoubtedly has caused a revolution in the world of Echinacea breeding and breeders.